This essay surveys the theme of the journey to Alaska as a quest in American cinema. The films Into the Wild (Sean Penn, 2007) and the documentary Grizzly Man (Werner Herzog, 2005) are my primary focus. However, the discussion ranges over a dozen-plus films that are located in or on the way to Alaska, from Charlie Chaplin’s Gold Rush (1925) to Kelly Reichardt’s Wendy and Lucy (2008). The Penn and Herzog films extend a tendency to imagine Alaska as an “othered” dimension. Their critique of the “Lower 48” lifestyle functions as a necessary cleansing that must precede more egalitarian concepts and practices of sustainable living (Jacobs 1999; Agyeman et al. 2003). These films evoke a sense of déjà vu for me. As a boy, I would look at boots, guns, and camping gear in the Sears-Roebuck catalogue with my father, and fantasize about “Going to Alaska.” Stories were circulating around 1959-61, when we lived in Nevada, about homesteading on “the last frontier.”1 Dad remembers seeing them on TV, in the papers, and in the junior high weekly readers where he taught, part of a push to recruit settlers for the 49th state. Dad was impressed by pictures of cabbages grown to the size of a half-bushel basket, spurred by volcanic soils and long summer days. Dad thought about this “free-spirited wild idea” half-seriously for awhile, Mom remembers. We still engaged in Alaskan “sand castling” years later; we still talked about getting chain saws in order to build a log cabin in Alaska. In retrospect I understand that my boyhood fantasies about Alaska were grounded in broader cultural attitudes about wilderness. I recognize a common trajectory with the social and psychological forces that produced these “going to Alaska” narratives: like generations of young men, I was moved by Jack London’s Call of the Wild. Whether hiking desert mountains or hitchhiking the byways, I shared in a hunger to escape to the open spaces that inspire vision. In cinematically going to Alaska I wish to understand the collective and personal dimensions of how these stories have “touched a chord” with so many, as Penn says of his reaction to the book Into the Wild, by Jon Krakauer. I think that Penn’s description of the nature of that chord could be applied to many movies about Alaska: “One part was trust issues in a family and society at large,” but an arguably “greater aspect was this wanderlust that everybody shares in” (Keyes 2007). Such issues and urges are not limited to one part of the ideological spectrum. 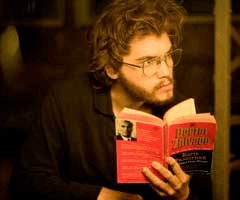 Although Into the Wild “contains elements of ideological critique,” Penn and Krakauer place Chris McCandless, hero of the narrative, “in a largely apolitical, homegrown tradition of radical, romantic individualism,” as A. O. Scott notes (2007). That individualism has radical elements, but the extremism of someone who drifts north to the last frontier could as well be that of a right-wing survivalist as of a leftist “tree-hugger.” “Alaska has long been a magnet for unbalanced souls,” observes Krakauer (1993). The state has inspired extreme responses amongst two kinds of “homesteaders.” One group wanted to make quick money. That objective has left its mark in movies about Alaska. But the second reason has a perhaps disproportionate presence in the cinematic imagination: Alaska as an extreme wilderness where one can escape from a “poisoned” civilization, and be reborn. This was the “call of the wild” for McCandless and Tim Treadwell, the Grizzly Man. When Chris carves in wood on arrival to Alaska his aspiration to “kill the false being within,” I recognize something of my idealism as a young man. The urge to give up everything in order to live in what James Fenimore Cooper’s Pathfinder called “the true temple” has bitten many over decades.2 McCandless and Treadwell both fled from trauma or dysfunctional families, were deeply alienated from mainstream society, and sought a form of redemption in Alaska. Treadwell felt that grizzly bears — one of which eventually ate him — saved him from an addictive personality. Despite troubling facets of Treadwell’s personality, I also feel a sense of kinship with him. But by the latter part of the first decade of the 21st century, it had become impossible for many of us to think about Alaska without a healthy dose of parody and satire. 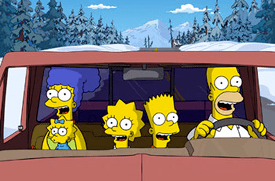 Hence I include The Simpsons in this discussion, as it lampoons many things that we project onto Alaska. There are two kinds of Alaskans, says a character in Insomnia: “the ones who are born here, and the ones who come here to escape something.” My interest is less in the state than Alaska as a state of mind, and a mythical destination. 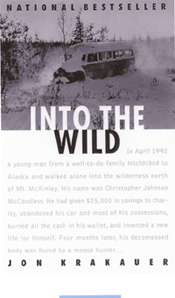 Alaskans themselves have been cynical about the runaways, including “crackpots from the Lower 48 who come north to live out their ill-considered Jack London fantasies.”6 Into the Wild is about what McCandless learns on his one-way “Alaskan Odyssey” — including what he learned (too late) about what he had projected onto Alaska. But it is also, of course, a mirror for the audience. Our lessons learned through this film are deepened through an awareness of real-life contexts — both McCandless’s life, and his impact through a mythic afterlife. On dropping Chris off at the Stampede Trail, James Gallien gives him a pair of rubber boots. His 30-pound backpack “struck Gallien, an accomplished outdoorsman, as an improbably light load” (Krakauer 1993). Half of that was books, which puts a twist on McCandless’s ignorance about living in the wild. Ralph Ellison once said he learned how to shoot birds by reading Hemingway.8 McCandless projected his readings onto Alaska. This young man from a privileged background had adapted Tolstoy’s attitudes on the spiritual value of renunciation. The film does not tell us Gallien’s thoughts on what Chris left in his truck — including a road map “he’d scrounged at a gas station . . . along with his watch, his comb, and all his money” (85 cents). “I don’t want to know what time it is, or what day it is, or where I am. None of that matters,” he cheerfully told Gallien (Krakauer 1993). To call McCandless “stupid” seems excessive, although he willingly did not “know what time it is.” Some have called him mentally ill, or suicidal, charges that Krakauer and Penn are at pains to refute. 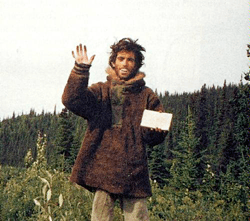 Still, the fact that McCandless set off into the wild without a compass or map indicates the extreme nature of his rejection of “family and society at large.” These details underscore the scope of McCandless’s tragedy. In fact he succeeded in living off the land with only a 10-pound bag of rice, and a semi-automatic .22 rifle, for two months. He had concluded his “pilgrimage” and was ready to return to family and society, trying to hike out July 3. But he could not cross the Teklanika River, swollen with rains and snow melt. Only when forced to return to the bus did his downward spiral commence. But with a topographical map, he would have known that there was a hand-operated trolley ¼ mile away from where he turned back, with which he easily could have crossed. Such a map would also have revealed the existence of emergency supplies in shelters nearby. But people who knew Chris well, such as his sister Carine, have said that he was so “mule-headed” that if he had been aware of the existence of such back-up forms of help, he just would have gone further into the wild. McCandless’s quest to escape any possible taint by civilization has a kindred consciousness in the narrative voice Le Clezio’s novel The Giants. In this metafiction about the corporate takeover of social space and consciousness, the narrator rages that “one was . . . inside the film, being projected onto the screen in the shaft of light, and so it was really quite impossible to be free . . . .” (Le Clezio 2008: 12). Having realized that he was inside the script of a social system that had lost the spirit of truth, McCandless determined that the only way to catch sight of truth was to lose sight of human society. These words-on-wood are Into the Wild‘s narrative framework, a sort of “Pilgrim’s Progress” in which Penn flashes back to McCandless’s family background, and his two years of vagabonding, which prestructure his Alaskan Odyssey. After these back-stories, as we watch fragments of Chris’s life on the bus and in the Alaskan countryside, we understand more fully what has brought him to this place and state of mind. In focusing on the bus, I will follow Timothy Corrigan’s suggestive questions about the construction of the mise-en-scène. What is within the frame, in relation to what is left out, is essential to the “theatrics of realism,” he insists. Corrigan asks: “What realistic details in the mise-en-scène relate to the actions of the characters or themes of the movie: the clothing, . . . the props, or the outdoor world?” Or: “What is the significance of this off-screen space or its relation to what is seen within the frame?”(2007: 50-51; 63). Sean Penn constructs a mise-en-scène that dramatizes how the “outdoor world” impinges upon interior space — both Chris’s consciousness and living space. By “outdoor world” or “off-screen space” I mean both the Alaskan wilderness and the backstory of Chris’s vagabonding and social relations, which constantly penetrate what is inside the bus. One wonders what McCandless meant by “ultimate freedom.” A “spiritual pilgrimage” in which being “lost in the wild” was a prelude to what? In a last letter to his friend and employer Wayne Westerberg, he said he might not survive, and ended with the ritual declaration: “I now walk into the wild” (Krakauer 1996: 10) Civilization had “poisoned” him, but the best of civilization gave him words to describe both what he was fleeing, and what he intended to embrace. These words were Chris’s companions on the bus. Krakauer notes several significant passages that Chris highlighted, in the paperbacks found with his remains on the bus. From Leo Tolstoy’s novella Family Happiness: “I wanted movement and not a calm course of existence. I wanted excitement and danger and the chance to sacrifice myself for my love” (1996: 15). And the strange aridity of his love for the wild, for the nonhuman that cannot be tamed — is summed up in the words of his “King,” Jack London’s novel White Fang: he sought “the masterful and incommunicable wisdom of eternity laughing at the futility of life and the effort of life. It was the Wild, the savage, frozen-hearted Northland Wild” (Krakauer 1996: 10). This “frozen-hearted” eternal wisdom that was contemptuous of “the effort of life” intruded upon Chris’s domestic space, and his psychic space in a myriad of ways. The lethal bite of that which is off-screen, in the “outer world,” is symbolized by Chris’s need to keep tightening his belt. Each stage of his Alaskan Odyssey, and the closure of the pre-Alaskan flashbacks, is marked by Chris’s pulling the belt ever tighter around his disappearing waist. By the time his corpse was found, he weighed only 76 pounds. This is conveyed by the diminutive Hirsch, who dropped from 156 pounds to 115 pounds — a loss of 41 pounds — during the year-long filming (Keyes 2007). As the leather belt hangs down like a famished tongue from his jeans, he has to cut ever more holes with a knife. These holes, and his disappearing flesh, are in a real sense the most visible signs of his Pilgrim’s Progress. This belt itself has a many-layered meaning — as a piece of clothing and one of the “props.” McCandless made the belt while he was informally apprenticed to Ron Franz, an elderly leather-worker with whom he formed a friendship while at Salton City and the Anza-Borrego State Park, shortly before leaving for Alaska. The belt is engraved with a linear visualization of many of Chris’s adventures during his two years of vagabonding — scenes on cowhide that are shown near the end of the movie. “Executed with remarkable skill and creativity, this belt is as astonishing as any artifact Chris McCandless left behind,” Krakauer writes (1996: 37). But he left the belt with Westerberg in South Dakota, where he worked just long enough in April to raise money for provisions. Each time Chris tightens his belt, it is a reminder of and an elaboration on what he has left behind. This includes friends with whom Chris stayed in contact, who were deeply impressed by his intelligence, courage, and charisma. They were also struck by the “issues” or complexes that haunted him. In particular, many of them remember his rants about parents or politicians and “the endemic idiocy of mainstream American life” (Krakaeur 1996: 37). Some of this comes through in the film’s reconstruction of his time with Westerberg, or in conflicts with his parents. All of these voices are present on the bus, as the film constructs the narrative; and one has the sense that a sorting out of these human relationships is very much a part of what in fact constitutes Chris’s “Alaskan Odyssey,” as he meditates on it, more often than not while sitting on the bus. When Penn saw Krakauer’s book in 1996, it was the bus on the cover that “intrigued” him, pulled him in so that he bought it and read it twice that night . The bus is central to Into the Wild‘s symbolic power. McCandless’s destiny on the bus is death. This jibes with much of the cultural background just sketched. That the book and film succeed in developing narrative momentum when we know all along the tragic conclusion, and that they awaken empathy with a seemingly self-destructive hero, for most of the audience, is a tribute both to the archetypal power of McCandless’s life and to the artistry of Krakauer as a writer, and Penn as director. Both book and film convey the tragedy of Chris’s death in a way that suggests a triumph of the spirit. Chris posted an S.O.S. on the bus — he wanted to live — but was at peace with the consequences of his decisions. In his last photo he was “standing near the bus under the high Alaskan sky, one hand holding his final note toward the camera lens, the other raised in a brave, beatific farewell . . . . [T]here is no mistaking the look in his eyes: Chris McCandless was at peace, serene as a monk gone to God” (Krakauer 1993). The film’s ending is open to multiple interpretations. One of my students suggested that Chris learns that “nature can be just as terrifying as society.”13 In the film he “misreads” nature, confusing a poisonous plant for an edible plant, and dies from a “poisoned nature,” an irony considering his obsessive refutation of society as poisonous.14 But the film also clearly conveys something of a spiritual knowledge gained at the end. The last image on the bus is of Chris, now awaiting the end in his sleeping bag, looking up with a look of rapture toward the light of the glorious Alaskan sky. The critical and economic success of Into the Wild indicates a public hunger for the themes of a self-sacrificing hero, and pilgrimages into the wilderness. We have many templates for icons whose early deaths are understood through the lens of a “meaningful sacrifice” for the liberation of a people, as with Martin Luther King Jr., Che Guevara, Bob Marley, etc. McCandless’s more personal calvary was for the benefit of his union with God-as-wilderness, rather than an attempt to reform a social order. But it is a reminder of what it means to live for an ideal bigger than ourselves, that requires sacrifice. McCandless’s quest for extreme freedom begs the question: “Is such liberation desirable, or even possible?” (Scott 2008). Both extremes of the polarized response to this narrative leave one suspicious. One finds hagiographic praise of the sort that idealists have traditionally heaped on figures such as Che who sought out a heroic death. Such blinkered praise overlooks some troubling features of McCandless’s life. First, he had a punitive attitude toward his parents, despite evidence that he was well loved. The irrevocable cutoff of communication with his parents is what may be most hard to stomach, even for those who are sympathetic to the young man’s rebellion against materialism, etc. And yet in our heart of hearts, many of us also fantasize about that. The family that Chris rejected, both biological and national, was represented for the young man by his father Walt. As an aerospace engineer who worked for NASA and Hughes Aircraft, Walt McCandless seemed to embody the values Chris felt born to oppose. His issues with trust started with the feeling of betrayal when his father hid the existence of six children from his first marriage, and was still married when Chris and his younger sister Carine were born. None of this really justifies the virulence of the rejection of his parents that Chris expressed in letters to his sister, or in rants to his friends. But it does help to explain why Chris felt that his father was synonymous with a political and cultural order that he had come to oppose from an early age, and that was characterized by the military expansionism, jingoism, and increasing national self-satisfaction of the Reagan years. The second problem is McCandless’s dangerous romanticizing of the wild. This attitude has exasperated Alaskans, who have to fend with other dreamers who want to “be like Chris.” Yet the harshness of their condemnations reveals a cultural myopia. To understand McCandless’s rejection of mainstream American life, one would have to consider that much of his critique was justified. The moral bankruptcy of the elites with whom Chris’s father worked seemed to require extreme measures, something like Norman Morrison’s self-immolation in protest against the Vietnam War in 1965.15 People who take ideas seriously are both a threat and an inspiration. His consciousness set aflame by his readings of authors like Thoreau, Tolstoy, and London, McCandless abandoned his car and gave away or burned his money, then took up residence at the “margins of our society” (Krakauer 1996: 13). Considering that cars, money, and private property are sacred in the U.S., his rejection of his father, of materialism and, apparently, of his country inspired an outrage that was entirely predictable, once the story went mainstream, and other would-be rebels began singing Chris’s praises. On one level, I found the critique at the heart of the film convincing, much as I was moved by the critique at the heart of a film that Penn made as a young man: The Falcon and the Snowman (John Schlesinger, 1985). I find a measure of agreement in this online assessment: that McCandless’s death, as represented by Penn, is “symptomatic of an entire American generation, whose malaise with the tragic realities of the modern world . . . reflect the shortcomings in what modern societies and their leaderships often wrongly consider as an evolution toward progress or toward a better life” (Kadivar 2007). The reception of this film reinscribes the same cultural dividing line that has plagued the U.S. since the 1960s. The right crusades to save their country from the perceived excesses of that era. Meanwhile, U.S. popular culture reveals that running beneath the surface, and sometimes erupting into the mainstream, there is a reservoir of people who dream of striking Samson-like blows against the system they believe has “paved over paradise” and reduced humans to unthinking consumers. McCandless was one of those young people who dreamed of Samson gestures. But one recurring theme in criticism of McCandless demands attention. The ranger Peter Christian writes: “In the end, he was sadly ordinary in his disrespect for the land, the animals . . . and the self-sufficiency ethos of Alaska, the Last Frontier.” Similarly, Krakauer quotes a letter from Nic Jans in an Inupiat village in the far north: “Such willful ignorance . . . amounts to disrespect for the land, and paradoxically demonstrates the same sort of arrogance that resulted in the Exxon Valdez spill” (Krakauer 1996: 51). This notion that going into the wilderness unprepared is a form of disrespect is similar to the attitude that one hears about a sport steeped in history, such as baseball. Players who flout the rules, or who comport themselves in an unmanly way, are said to be showing disrespect for the game. The game carries a moral weight; those who flaunt written or unwritten codes of behavior are perceived to be committing a quasi-sacrilege. “Play the game right,” they are told. There is something similar here in the critique of McCandless’s failure to engage with the actual Alaska, and the code of behavior it demands. It implies that there is a moral immaturity in Jack London’s romanticizing of the wild. Christian and Krakauer react with instructive difference to the commonality they feel with McCandless. “I know the personality type because I was one of those young men,” writes Christian. But asking “Why am I alive and he is dead?” he seems to feel superior: “if he had respected the wilderness he was purported to have loved,” then he would have lived. By contrast, Krakauer seems to recognize a “there but for the grace of God go I” kinship. Having once taken potentially fatal risks in the wilderness, Krakauer sees an enduring value in the young man’s wild passion for Alaska. But as for the lessons learned, the perception of “arrogance” in McCandless’s attitude toward animals is worth pursuing, and will be developed in my discussion of Grizzly Man. And the argument that McCandless disrespected Alaska’s “self-sufficiency” ethos points to a larger problem: Native peoples are nowhere to be found in McCandless’s Alaska. But they are a fundamental component of the real Alaska and a cornerstone of cinematic imaginings of Alaska as an American other, as we shall see. 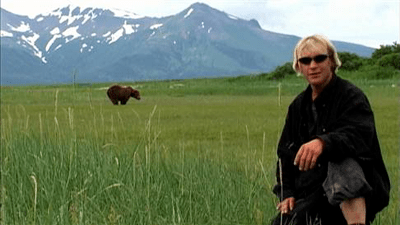 Werner Herzog’s critical but appreciative reframing of Timothy Treadwell, the “Grizzly Man,” has helped construct a personality cult for yet another eccentric whose death in Alaska has mythopoetic dimensions. Yet, as with Into the Wild, a good deal of the public response has been harsh. Certain parallels become evident in the trajectory of both subjects, as well as in the tenor of the public response to them — both hero worship and condemnations. Like McCandless, Treadwell has been accused of “misreading” nature. However, this criticism, unlike Sean Penn’s celebratory portrait of McCandless, is a central part of Herzog’s filmic portrait. 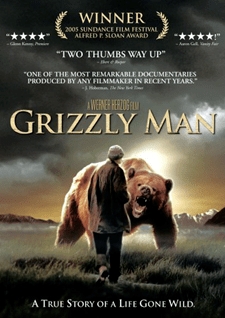 My focus is on Herzog’s reframing of Treadwell’s Alaska — notably his desire to “mutate into an animal.” Framing is crucial in Grizzly Man, a documentary that is a thought-provoking meditation (in an unusually restrained manner for Herzog)16 on the age-old urge to merge with animals. Within the generic conventions of a quest to Alaska (those who go there “to escape something”), that urge is given a twist by Treadwell’s envisioning of Alaskan bears as a redemptive force. He felt that the bears had healed his own demons; he also adapted them as a sort of shield that would protect him, as with McCandless, against the “poison” of United Stated commercial culture. The double framing is evident from the very first moments of the film. Treadwell walks into his own frame and speaks into the camera in a confessional theatre that Herzog chooses to use as his subject’s desiderata. But before we hear Treadwell’s voice, and Herzog’s gloss, it is worth examining what Treadwell chose to put in the frame. In the distance are immense mountains with patches of snow and blue foothills. Most of the frame is green pasture. At medium distance, a massive brown grizzly bear grazes. As he talks, Treadwell frequently looks over his shoulder at this bear. There are, then, three subjects in this frame: Alaska writ large; the bears in the background; Treadwell front and center with nature and animals in a supporting role. Treadwell’s opening performative confession is characteristic of his manner of being in front of his camera, supposedly “alone” in the wilderness. “I love the bears. I will protect them, I will die for them . . . . I will become one of them.” He walks off frame and is heard saying: “I can smell death all over my fingers.” Treadwell seems to have envisioned not only his future death-by-bears, but also his media afterlife: “This stuff could be cut into a show later on,” he remarks. But he will have no control over this “cutting,” or framing. In the tension between Treadwell’s heroic self-concept and Herzog’s critical but appreciative reading emerges the dramatic momentum of the film. In an interview with the Austin Chronicle, Herzog framed his own reframing this way: “I have an ongoing argument with [Treadwell] throughout the film [about his] sentimentalized view of Mother Nature . . . the “Disneyfication” of wild nature.” In Herzog’s view, this is a “misreading of what’s out there.” Herzog’s disagreement with Treadwell’s fundamental misrecognition of the “nature of wild nature” is rather gentle, however: “I argue like I argue with my brothers, and I love them” (Ingman 2005). As Herzog narrates, Treadwell’s finger reaches into the frame to caress or warn a bear. 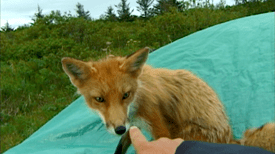 This finger that penetrates the frame appears often, as with his “pet” fox. It is as if Treadwell is retouching Herzog’s reframing: his urge to enter a post-human dimension intrudes into the frame but is also ever-present in the “outer world” off frame (Wolfe 2003). This desire to “become one of them” is commented on by everyone Herzog interviews, in ways ranging from the appreciative to the neutral to the contemptuous. The ecologist Marme Gaede states the obvious: “He wanted to become like the bear [or] mutate into a wild animal.” But her comments add depth, and a necessary antidote to more reductive views, in two ways. First, she quotes Treadwell’s last letter: ‘I have to mutually mutate into an animal to live the life I live out here.’ The mutuality of that imagined mutation is something to which I will return. Second, Gaede is right, I believe, in stressing that this urge to merge with animals, “the sense of connecting so deeply that you’re no longer human,” has a quasi-religious dimension. Herzog “sees something redeemable in the way Treadwell lived his life” (Prager 2007: 86). This redemption is primarily based on the images he left behind. The footage of Treadwell running with foxes (after his confession) moves Herzog to argue that Treadwell achieves a form of cinematic greatness. “There is something like an inexplicable magic of cinema,” Herzog says. When the camera is aimed at animals, rather than at himself, Herzog does indeed often seem to achieve magical results. Yet there is also an “inexplicable magic” to some filmed moments of Treadwell’s interactions with the animals. If the first shot in which he walks into his own frame seems over-staged, what Herzog chooses as the ending footage, a long shot of Treadwell walking away from “his” frame, followed by two bears, has an enduring suggestive power. When he stops posing for the camera and allows us to witness the bears following him “off-stage,” he succeeds in reframing the boundaries of what we had thought possible in human-animal relations. “Sometimes images develop their own life, their own mysterious stardom,” Herzog muses. Treadwell was an aspiring actor as a young man, and clearly wanted to be a star. Yet he also desired some fundamentally un-star-like things, within the realm of celebrity culture. Gaede, the ecologist, reads from one of his letters to her: “There are many times when I feel that death is the best option. My work could be taken much more seriously, that in living I can’t do.” There was a sense in which Treadwell was the embodiment of Bazin’s theory of a “cinema of transparency,” which required a willingness “to go to the point of dying for your images” (Daney 2003: 37; Johnson 2008: 72). Treadwell’s “mutation” was a transfiguration. But what was mutual about it? Not only was Treadwell figuratively “dying to mutate” into a bear; he also sensed that the productive afterlife of his work depended on his death. He had to make the ultimate sacrifice in order for his work to mutate into something that benefited the animals long-term. Treadwell and McCandless may not have had a literal death wish, but both accepted the possibility of death as the price for the mutation they desired. Julie Schutten suggests several ways of thinking about “mutual mutation.” Some seem far-fetched: “It is difficult for human rationality to entertain the thought that the bears chose to engage in a relationship with Treadwell for 13 summers before eating him,” she acknowledges. But Schutten is right that the film allows us to pose “the question of what the ethical principles of interconnectedness, mutual interdependence, and a ‘web of life’ mentality look like when actually embraced.” Herzog’s Treadwell suggests that the practice of a “community of interdependent parts” in which humans are decentered is not so attractive as the theory (Leopold 1966: 209). But the deaths of these young men with a “fatal attraction” to the Alaskan wilderness present a valuable lesson: that “moving to an ethic of environmental sustainability . . . requires sacrifice (and) considerable relinquishing of control and a heightened vulnerability of humans to other-than-human forces” (Schutten 2008: 195; 209). The “baggage” that McCandless and Treadwell hauled into the wild — Chris’s books, and Timothy’s addictive personality — can be seen as indicators that they played the role of “holy fools.” We can criticize their foolishness, but historically, only those extremists who go “beyond the boundary” of social norms succeed in going from the known into the unknown and teach us something new. Like Quixote taking his books too literally, McCandless misread the “tall tales” of nature writers like London. But as Quixote’s quests have been an enduring source of instruction and entertainment about the human condition, one suspects that McCandless and Treadwell will long provide “astonishing insight about our innermost nature,” to paraphrase Herzog. 4. A place where seekers can receive a vision from native peoples, often through a bear spirit. Charlie Chaplin’s Gold Rush establishes visual templates for the first three of these themes. 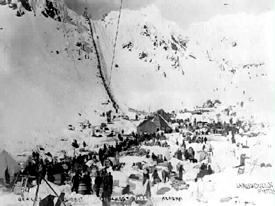 Chaplin’s inspiration for the film first came from a stereoscopic photo of Chilkoot Pass — prospectors climbing up a snowy path.20 The photo appears at the start of Gold Rush; this is a threshold/gateway into the wild, or into the realm of riches, where men will have to struggle with beasts and beastly weather and often with other crazed humans in order to bring back their fortunes, or die trying. This photo, or live-action recreations of this scene, appears in several Alaska films, including White Fang. A bear follows Chaplin’s “Little Fellow” as he tramps into the snowy wilderness, a visual motif parodied in The Simpsons Movie. But Chaplin also sets the template for the theme of Alaska blurring the line between humans and animals. 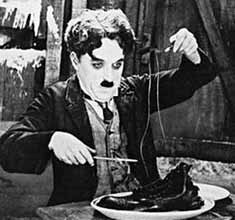 Chaplin and his partner Big Jim are driven by hunger to eat the leather of their boots; later the hunger produces delusions in Big Jim, who imagines the Little Fellow to be a chicken and tries to kill him. But Chaplin’s Little Fellow saves his own neck, and both of their lives, by shooting a bear, which becomes their staple food source. The danger of humans becoming food for bears is present in numerous films. But sometimes the struggle swings both ways, as in The Edge, where one member of a “marooned” party of three is eaten by a Grizzly. But when this same bear, which we are told has developed a taste for human flesh, tries to devour the other two city men, they trap and kill it. They not only feast on its meat (and indirectly, eat their friend whom the bear has devoured), but also wear its hide as clothes, hence becoming true men. In The Simpsons Movie, being followed by a bear leads to the encounter with Native peoples. Homer is saved from the bear by an Indian, who takes him to see a Native “Medicine Woman,” who browbeats him into having an “epiphany” in which he realizes his own selfish myopia. With the moral vision induced by this Indian, Homer determines not only to return to his family but to rescue the citizens of Springfield from their entrapment in a dome built by greedy corporate overlords. The recurring references to Nanook — subject of the “first documentary”23 which was in fact a primitivist fiction — should alert us to “authenticity issues” in films that try to assign a role to Native peoples — and bears — in films set in Alaska. On Deadly Ground is particularly egregious. In a dream sequence, Taft fights with and stabs a bear, is thrown into raging waters, and then in a dream within the dream, has to choose between a naked Native babe who beckons on his left and an old Indian woman with a rattle on his right. Using powers of self-restraint nowhere else evident, Taft chooses the old woman. Like the Indian woman in The Simpsons, she explains this white man’s destiny. She is grief-stricken because “I see what man has done to Mother Earth.” But never fear, the white Indian (a recurring them in films about Alaska — see North Star) will save the day. “I have chosen you to go forth and tell them,” the old woman tells this tall gringo dressed in animal skins. “You must teach them to fear the bear.” This telling and teaching requires Taft to blow up an oil refinery in an explosion of truly apocalyptic scale (monkey-wrenching the oil barons), and then at movie’s end, to lecture a group of assembled Native Alaskans about what they must do to save the earth. In the movies, Alaska is an “othered” dimension in which the abnormal is the norm. People driven mad by the quest for gold is a pervasive theme in the cinematic Alaska (The Far Country, North Star, etc.). But it is hardly gold alone, or hunger for the wild, that drives people over the edge. They are driven crazy by the days without darkness of the mid-summer sun (Insomnia) or the perpetual night of mid-winter (The Barber). In this extreme environment people always seem to “go over” into another realm that can hardly be imagined outside Alaska. That realm is often animalistic — Call of the Wild. But drawing closer to the animal kingdom tends to be presented as having a redemptive potential, as long as one does not lose sight of the necessary boundaries or buffers between the human world and the wild — as with Treadwell and McCandless. In drawing conclusions about Into the Wild and Grizzly Man with this history of the cinematic Alaska in mind, I am struck by how human love seems absent from these prior films. The Alaskans we have seen on screen do not seem like a loving bunch, whether native born or runaways — possibly excepting John Sayles’s Limbo. The contrast becomes more apparent when one thinks about how very important love is for the relative redemption that both Treadwell and McCandless find in Alaska. Treadwell’s love for animals is voiced in a tone like parents use for infants. Those who have felt overwhelmed by love when talking to their babies should recognize this tone of voice, and may identify with this aspect of the Grizzly Man. It may seem strange to us that he can completely give himself only to animals, and we may pity his estrangement from the human world (children aside, of course). Witnessing his profane rages against the Park Service, we may lose much or all of the empathy we have developed. But when Treadwell says, in The Grizzly Diaries, that these bears have become like his human kin, as he has watched them develop over the years, most viewers should recognize a psychological reality. We can recognize a certain admirable purity in his love when the pilot Willie Fulton says that the biggest tragedy, from Treadwell’s perspective, was not that he lost his life but that a bear was killed as a result. As Fulton says with complete conviction, Treadwell would not have wanted even a bear that had eaten him to have been killed. 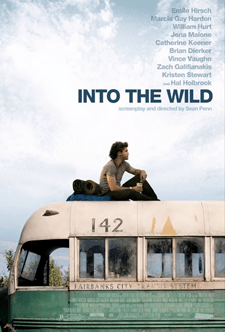 In the end game of Into the Wild, McCandless confronts the significance and consequences of his “running away” from human love. But this running away is a “universal human failing,” as Michael Casey has written about Che Guevara’s flight from family and nation.26 And in the failure there is something of the wisdom of the greatest human tragedies, from the Greeks on. The reckoning at the heart of McCandless’s end game begins with the friendship he forms with an old man living in the desert near the California border with Mexico, shortly before Chris left for Alaska. After quizzing “Alex” about the family he has disowned, Ron offers these words of wisdom: “When you forgive you love. And when you love, God’s light shines on you.” We see that light in the desert sky, as we later see it through Chris’s eyes, in the Alaskan sky, at the moment of his death. That light, and a transfigured understanding of love, are central to the story’s denouement, and viewers’ capacity to “forgive” Chris for so badly misreading nature, and so grievously wounding his family. This end game makes us see with more clarity the extremity of Chris’s unpreparedness. The rubber boots handed to him at the last moment by James Gallien are just the surface. At the moment of his final flight, Ron gave “Alex” a box of supplies including a machete, a collapsible fishing pole, and a fishing net. It seems that, aside from a rifle he bought in Fairbanks, McCandless intended to take almost nothing into the wild besides his books. And it is the rifle and his books that primarily mediate between McCandless and his beloved wild — the rifle outside, the books inside the bus. Given McCandless’s lack of awareness of Native peoples in Alaska, it is ironic that he tries to save himself with a native ethnobotany — Tanaina Plantlore. In the filmic version of his descent into death by starvation, this process is accelerated when, this ethnobotany field guide in hand, he goes hand and knees into the bush in search of edible plants. It is only after reading the passage from Zhivago that he returns this Ethnobotany and realizes that that he has misread the text. He consumes the poisonous seeds of the Wild Sweet Pea, otherwise known as the brown bear’s wild potato, which he had mistaken for the edible Wild Potato Alaska Carrot.28 With Pasternak’s words about “right names” in mind, he then reads nature’s death sentence: “If untreated, leads to starvation and death.” Outside, the only bear we see in this film, a Grizzly, approaches Chris beside the bus, sniffs his emaciated body, and turns away, uninterested in this stringy meat devoid of fat. In his agony, Chris sees texts he has read: the word “people” comes to the foreground; he has an epiphany about human community. In a fantasy sequence he runs into his parents’ arms;29 in forgiving them, and perhaps himself, he sees “God’s light” in the Alaskan light pouring in through a bus window. And as the camera pulls out through the window and back to a distant shot of the bus, the last frame is the self-portrait the real McCandless took leaning back against his beloved bus. We understand that in death, at least, McCandless finally found the meaning of his Alaskan quest. Treadwell also changed his name (née Dexter). Sometimes the names and identities assigned to us do not match our aspirations. These two “American dissidents” fled their confining names/social norms and tried to reinvent themselves in Alaska. Their quest reframes our understanding of the role of Alaska in the American imagination. “We need the possibility of escape as sure as we need hope,” as Edward Abbey wrote (1968/1981: 148-49). In the cinematic rendering of the strangely triumphant tragedies of McCandless and Treadwell, this escape is a hope that springs eternal. Abbey, Edward. (1968). Desert Solitaire. New York: Ballantine, 1981. Agyeman, Julian, Robert D. Bullard, and Bob Evans, eds. (2003). Just Sustainabilities in an Unequal World. Boston: MIT Press. Boyle, T. C. (2000). A Friend of the Earth. New York: Viking. Peter Christian, Chris McCandless from a Park Ranger’s Perspective, (2006); retrieved 12-26- 2009;http://nmge.gmu.edu/textandcommunity/2006/Peter_Christian_Response.pdf. Corrigan, Timothy. (2007). A Short Guide to Writing About Film, 6th Edition. New York: Pearson/ Longman. Daney, Serge. (2003). 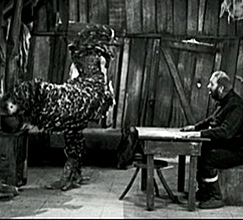 The Screen of Fantasy (Bazin and Animals). In Rites of Realism: Essays on Corporeal Cinema, ed. Ivone Margulies. Duke UP, 27-31. Ingman, Marrit. (2005). 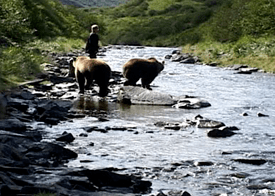 Discord and Ecstasy: Werner Herzog on Grizzly Man. Austin Chronicle (Aug. 19). Ivakhiv, Adrian. (2008). Green Film Criticism and Its Futures. ISLE: Interdisciplinary Studies in Literature and Environment 15:2 (Summer). Jacobs, Michael. (1999). Sustainable Development as a Contested Concept. In Andrew Dobson, ed.,Fairness and Futurity: Essays on Environmental Sustainability and Social Justice. New York and London: Oxford UP, 21-45. Johnson, David T. (2008). “You Must Never Listen to This”: Lessons on Sound, Cinema, and Mortality from Herzog’s Grizzly Man. Film Criticism 32: 3 (Spring). Krakauer, John. (1996). Into the Wild. New York: Anchor. Le Clézio, J. M. G. (1975). The Giants, tran. Simon Watson Taylor. London: Vintage Books, 2008. Leopold, Aldo. (1966). A Sand County Almanac. New York: Ballantine. London, Jack. (1903). The Call of the Wild. In The Call of the Wild, White Fang & To Build a Fire, with an Introduction by E. L. Doctorow. Modern Library Paperback Edition, 1998. Nash, Roderick Frazier. (2001). Wilderness & the American Mind, 4th ed. New Haven and London:Yale UP. Power, Matthew. (2007). The Cult of Chris McCandless. Men’s Journal (September). Prager, Brad. (2007). The Cinema of Werner Herzog: Aesthetic Ecstasy and Truth. 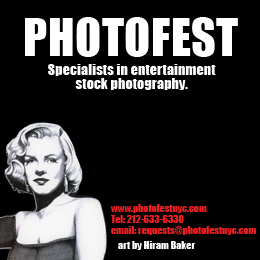 London: Wallflower Press. Schutten, Julie Kalil. (2008). Chewing on the Grizzly Man: Getting to the Meat of the Matter.Environmental Communication: A Journal of Nature and Culture 2:2, 193-211. Scott, A. O. (2007). Following His Trail to Danger And Joy. New York Times (September 21). Scott, A. O. (2008). The Most Social Guy Who Ever Wanted to Ditch Society. New York Times(January 6). Wolfe, Cary. (2003). 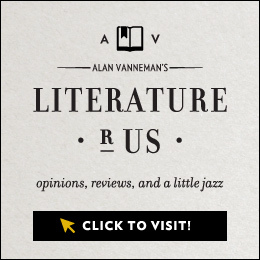 Animal Rites: American Culture, the Discourse of Species, and Posthumanist Theory. University of Chicago Press.